Ford's Edge Concept will feature a host of automated driving features. 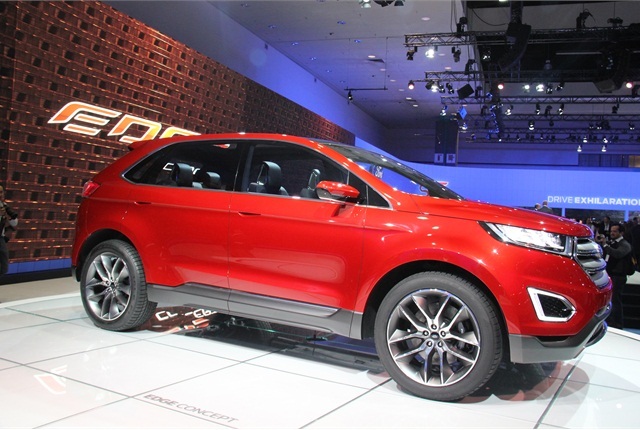 Ford Motor Company unveiled its Edge Concept mid-size SUV during the L.A. Auto Show on Wednesday. The new concept vehicle will feature a Ford EcoBoost engine and stop-start technology, which will become standard in all Ford high-volume vehicles, according to Joe Hinrichs, Ford's executive vice president and president of The Americas. This is only one of the vehicle's high-technology features. The Edge will be equipped with several advanced automated driving technologies, including self-parking and obstacle avoidence technologies. According to Hinrichs, who addressed journalists at the unveiling, the self-parking option is expected to allow a driver to park the vehicle either seated inside or outside the cabin. The edge will also feature collision alert, adaptive steering, and adaptive cruise control. "The original Ford Edge offered customers in North America a fresh, compelling choice for an accommodating, efficient and safe medium utility vehicle," Hinrichs said during the unveiling. "The next-generation Edge – previewed in the Ford Edge Concept – will build on these cornerstones to create a global vehicle with technology to make life easier, and design and craftsmanship to appeal to customers around the globe."